Sean Williams, Kate Middleton, Rob Maitner, and Seth Shelden in Asymmetric. Photo by Deb Alexander. BOTTOM LINE: An intense, fast paced, and surprisingly touching spy thriller. Political intrigue, corruption, torture, a nation at risk, and love. All of these are elements are included in Mac Rogers’ intense new play, Asymmetric, now playing at 59E59 Theatres. The taut eighty-five minute play takes place in the near future (Tuesday, October 20th, 2015, to be specific) and concerns a former spymaster named Josh (Sean Williams), who turned to alcohol after his wife Sunny (Kate Middleton) left him. His alcoholism cost him his job. However, his former colleague, Zack (Seth Shelden), informs him that there is a mole in the building who has been selling classified weapons technology to enemy countries, specifically about a drone that automatically cleans up any evidence of an attack. The mole turns out to be Sunny, who has her own reasons for selling the top-secret information. Also included is Ford (Rob Maitner), an amusingly ruthless interrogator. The title refers to “asymmetric warfare,” in which one side in a war has stronger military power than the other. It creates an appropriate parallel to the central conflict of the play -- Josh is forced to interrogate Sunny about the weapons, but she also holds information as to why she left him, a question which has bothered him for quite some time. The space itself, 59E59's Theatre C, is incredibly intimate, which compliments the claustrophobic setting of this piece. 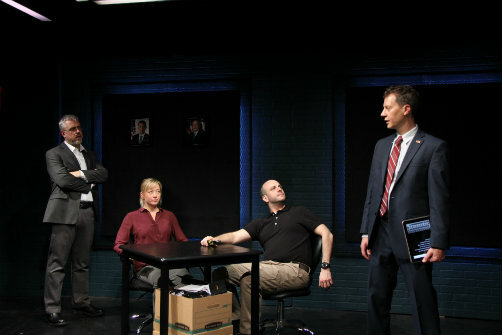 Travis McHale designed the appropriately sterile sets and lighting, which make you really feel like a fly on the wall of the interrogation rooms this play takes place in. The space’s intimacy raises the already high-stakes of Rogers’ play. Jordana Williams directs the play with a rapid-fire intensity that hits every beat of the characters’ emotional journeys. They each speak in a quick monotone that never becomes one-note -- rather, it fits the detachment of the characters, whose worth is measured by their kill count from the drones they set off. Middleton makes a great case for Sunny’s clandestine transactions to enemy sources. She also delivers her lines with a hilarious deadpan that provides some welcome comedy to the proceedings. Maitner nearly walks away with the show as the sadistic Ford. As entertaining as he is to watch, you’d never want to be the victim of his occasionally stomach-churning interrogation methods. While Asymmetric doesn’t probe the moral implications and complexities of drone usage, it is nonetheless a quick, satisfying and involving spy thriller that takes a sudden, touching turn at the end.